Invasive species have a long track record of disrupting native plants and animals, particularly on islands. As Vervet Monkey populations increase, what can we expect on St. Martin? Will monkeys take over our island? Although they are resilient enough to survive hurricanes and droughts, island ecosystems are delicate in some ways. Invasive species, in particular, have the potential to cause destruction and disaster when they encounter islands where they have no predators and little competition. Since the year 1500, 80% of all animal extinctions have happened on islands. St. Martin is not immune to this phenomenon. It lost three species due to the introduction of the mongoose: two lizards and one snake. Rats and mongoose are perhaps our most destructive invasive species. Both are omnivorous mammals—smart, fast and voracious. The raccoon is another, but we know less about its possible impact because it has been introduced to fewer places. 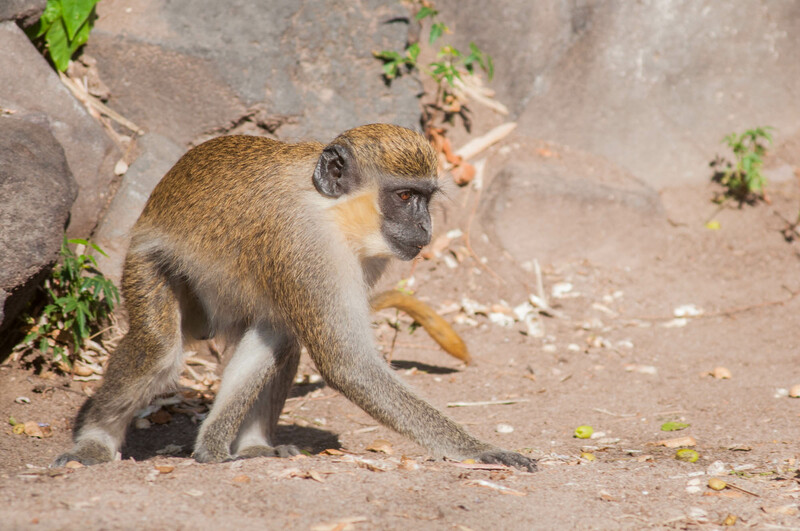 In recent years, the Vervet Monkey has been increasing its population on St. Martin. Agile and intelligent, it undoubtedly eats a wide variety of native plants and animals. Originally from Africa, this monkey was brought to St. Kitts and Barbados in the 1600s. The wild population of Vervets on St. Martin is much more recent, perhaps only a few decades old. A look at St. Kitts may tell us a bit about one possible future on St. Martin. Monkeys are very common on the island in both the mountain forest and the dry coastal scrub. Until recently large areas of sugarcane cultivation created a buffer between mountain-dwelling monkeys and urban areas. With the end of that industry, emboldened monkeys have spread nearly throughout the island. In the lush, beautiful forests of St. Kitts, many animals are strangely absent. Snails, so abundant on the wet slopes of Saba and even the dry forest of St. Martin are almost entirely absent. One might see a few lizards per day on Mount Liamuiga compared to a few lizards per tree on Pic Paradis. There isn’t enough research to prove that monkeys are responsible, but they are one of the few major differences between St. Kitts and other islands in the Lesser Antilles. Once a rarely seen novelty, Vervet Monkeys are more common every year, and seem to be on the verge of becoming an island-wide menace. Will lizards found only on St. Martin be driven to extinction? Will the forest and scrub of St. Martin fill with monkeys and empty of everything else? Without action, we will find out very soon. You can learn more about Vervet Monkeys and other invasive species on St. Martin at Amuseum Naturalis, located at 96 Boulevard de Grand Case. The museum is free and open 4-8pm on Tuesdays and Thursdays. Get more info at http://amuseumnaturalis.com.